This Nova is ready for cruising! She was just serviced, waxed, and received a few upgrades! See "Full Specs" for additional information! Starting from the swim platform you climb a ladder and walk through the transom gate into the immensely large aft sundeck. The sundeck is protected by removable eisenglass around the port and starboard sides; as well as, aft. Forward on the port and starboard sides are teak wing doors leading to the wide side decks that take you forward. Looking forward and to starboard you notice a wetbar with an icemaker. A centerline staircase leads you to the flybridge. The flybridge is large and well-equipped. Fully enclosed it even includes air conditioning vents. Stepping back down to the sundeck and looking to port you see another teak door. This door leads to the main salon. The Nova Heritage Sundeck has a large and spacious aft deck with Factory Hardtop on a large flybridge. There is a bright salon that is spacious and can be set up with multiple furniture configurations (depending on your wants and needs). Step down to a full Galley with an abundance of cabinet space, microwave oven, stove, Full refrigerator and double sink. Forward is the Guest Stateroom with double berth to port... step forward to dressing area with private head and shower, hanging locker and an abundance of stowage. Aft of the Salon is a very spacious Master Cabin with a Queen bed to starboard. There is a large closet, a sit down vanity, built-in cabinets for storage plus a full head with a shower stall. The salon, as well as, the rest of the interior is done in beautiful teak. The doors have gorgeous carvings on them. The feeling of all the cabins are very elegant, if not understated. There is a large settee to port in the salon and some assorted seating on the starboard side of the salon. Looking forward and to starboard you see the well-equipped lower helm. There is another door next to the lower helm that leads out to the starboard side deck. Along the three walls of the salon are multiple cabinets for storage. Stepping down and moving forward you come into the galley. 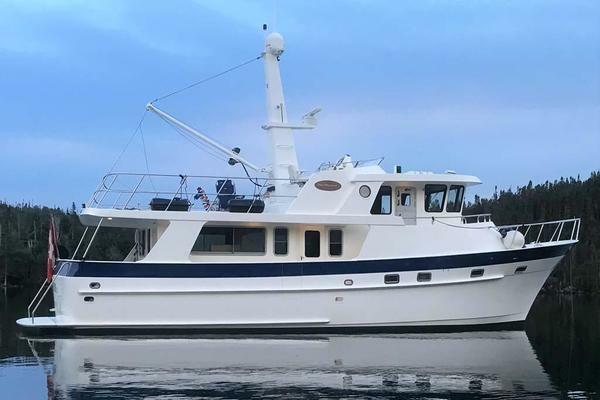 The galley is equipped with an apartment sized refrigerator, a microwave, a newer cooktop, a Galley-maid watermaker and lots of storage. Moving forward and to port is the forward berth. This is a double bunk with separate from the galley and is a suite - in and of itself after you close one door. Forward of the berth is a separate shower room to port and a large closet to starboard. The head sits in the forepeak and is very large for a 40 footer. This entire suite is perfect for weekend guests. Moving aft from the salon and stepping down takes you into a very surprising aft cabin. The starboard side is a queen berth and the port side has a large hanging closet. To call it a hanging locker would be an understatement. Looking forward and to starboard, there is an extremely large head with a vanity and another separate shower room. This would be a perfect stateroom for extended cruising or the liveaboard wanting to get away from it all.